Successful referral programs with the help of Aklamio's features. Launch a referral program your customers will love in mere days - we deliver the technology along with all the services to make your program a success. Aklamio will develop your white label referral portal where users can invite their friends, earn rewards and drive significant revenue growth. Referral portals embed automatically into your website. No need for any development resources. Run your referral program effortlessly across all your sales channels. Aklamio offers the necessary infrastructure to ensure a seamless user experience on your website, at your POS and through your call centers. All channels benefit from higher participation and conversion rates. Empower your customers to choose their favorite sharing channels and let them promote your brand virally. 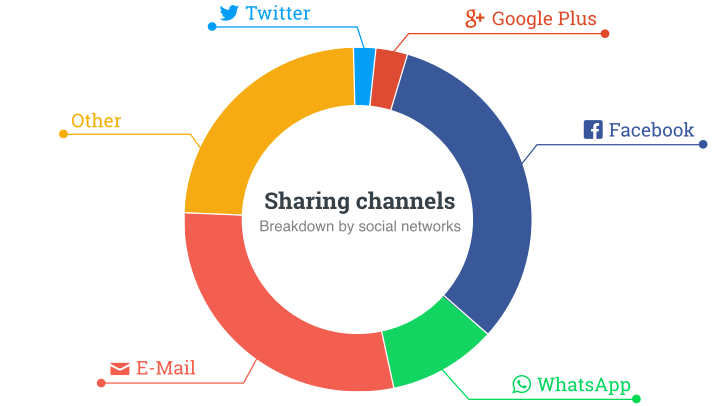 WhatsApp, Facebook, Twitter, LinkedIn, Google Plus, Email… all your users' favourite channels are supported and Aklamio will provide you insights on where you get referred most. Reach new audiences and increase your conversion rates by empowering your customers to recommend not only your brandbut also the products they know their friends will want to buy. Aklamio will analyze which products create most virality. Select the rewards system that works best for you! Choose between cash and discount codes, product or basket-based rewards, or add a bonus campaign on top! You are in full control and Aklamio will help you find the best performing reward setup. Customer support. Payouts. Fraud protection. Aklamio assists your customers with all program-specific questions and takes care of the paying out of rewards. Our specialized automated fraud detection system will safeguard your program while initiating rapid countermeasures. Turn referral marketing into your most successful acquisition channel with Aklamio. We develop the right strategies and campaigns for your rewards program based on comprehensive analytics. Aklamio also helps you plan and roll out new campaigns, sweepstakes and competitions. Many referral programs require users to enter a friend's email address to send the invitation. This practice violates the new EU General Data Protection Regulation (GDPR). Aklamio will never ask for the input of e-mail addresses of others or send e-mails without the express consent of the recipient and will behave in all other respects legally.